A cabalistic sign used as a talisman. It is a combination of the initial letters of "Attah Gibbor Le'olam Adonai," the first four words of the second benediction of Shemoneh 'Esreh (see Moses Botarel, commentary on "Sefer Yeẓirah," i. 2, and Ḥayyim Vital, "Peri 'Eẓ Ḥayyim, Sha'ar 'Amidah," 18, and Meir ibn Gabbai on "Shemoneh 'Esreh"). To the letters Yod, He, the numerical value of which equals fifteen, Isaac Luria added the numerical value of letters making twenty, which, when added to the fifteen, thus, 15 + 20 = 35, is equivalent to the sum total of the letters in Agla, that is, 1 + 3 + 30 + 1 = 35. 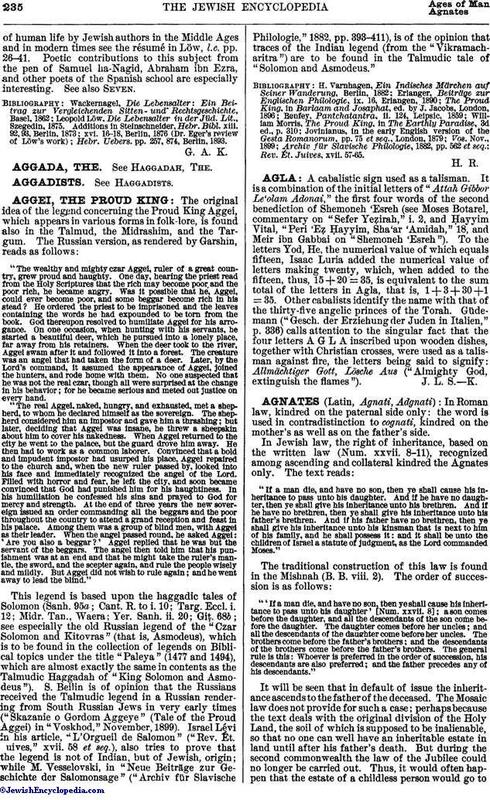 Other cabalists identify the name with that of the thirty-five angelic princes of the Torah. Güdemann ("Gesch. der Erziehung der Juden in Italien," p. 336) calls attention to the singular fact that the four letters A G L A inscribed upon wooden dishes, together with Christian crosses, were used as a talisman against fire, the letters being said to signify: Allmächtiger Gott, Lösche Aus ("Almighty God, extinguish the flames").